﻿ Digital And Technology Solutions Dallas | What Can We Do For You? Whether you need an organizational retooling app, an extension for customer engagement, or an innovative business idea – we are here to turn your ideas into your next innovative product! We specialize in developing completely customized web applications and stunning websites to match the needs of organizations of any size. As experts in developing Ecommerce ecosystems, we ensure flawless management of inventory, orders, and sales with the secure integration of payment gateway. We have dedicated teams of technical consultants, designers, developers, testers, and social marketers to help you launch your next winning products. We have the expertise necessary to design and deliver advanced Content Management Solutions that are driven by a advanced functionality. We design and develop seamless, highly engaging, user friendly, and scalable mobile applications that get featured in the AppStore and the GooglePlay Store. We align your website's interface design with your brand messaging to create a consistent image for your business. We help you set up, monitor and manage cloud environments on Amazon, Rackspace and Softlayer. We work as your strategic development partner to help you bring your project vision to life and meet your ultimate business goals. We make the most of agile project development practices to provide innovative solutions to your complex problems. Do you have a new web/mobile app idea? What does it take to create a successful app? The answer depends on the nature of your app and your business goals. Though most business owners have some idea of how to launch to the market, their outcomes often miss their expectations. The reason is because of poor execution, ignoring platforms, lack of monetizing strategies or a confusing user experience. At Cooperative Computing, we don’t just design your app to generate revenue, we make sure your product gets noticed by targeted audiences. We do this by working with you on your idea and guiding you through each step along the way through the launch. Our technical consultants recommend the optimal user experience and unique selling points that will make your app stand-out in the market. That’s not all. Because we are partners in your project we stick around even after the app launch to evaluate the market response and amend the strategy accordingly. And that’s how we make partners instead of just clients! Actions speak louder than words. We don’t just want to tell you how great we are, let us show you with the results of our satisfied clients. We create solutions for real-scenario client issues and offer solutions through top-notch product and marketing strategies that help them excel in their industries. We design UX and visuals that are visually pleasing, enhance the experience and gauge recurring engagement. We have a team of top engineers who develop, test and deliver a seamless and extendable product. 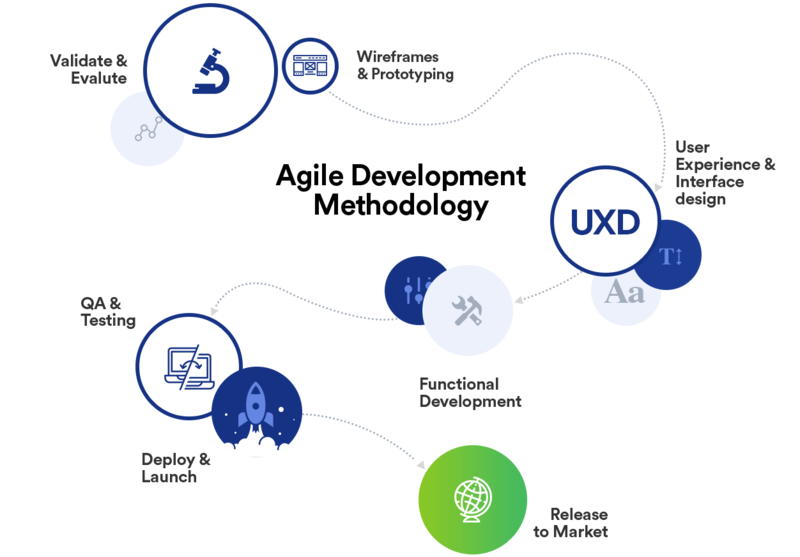 Our design and development strategists focus on the functional benefits of your proposed web and mobile app ideas to align them with your overall brand messaging.